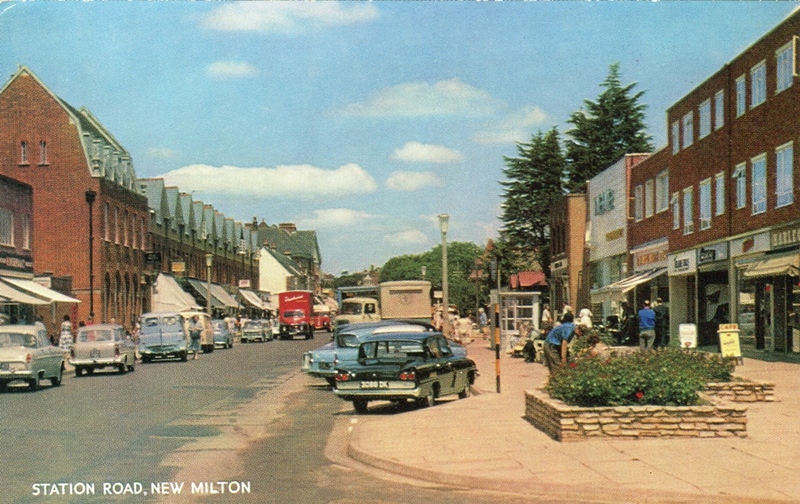 A fuzzy postcard I’m afraid but interesting to see the two Fords with reverse rake rear windows parked next to each other. Nearest to us the Consul Classic and in front of that an Anglia. What other cars had such rear windows? And why not more? The beautiful little Citroen Ami 6 comes to mind (I like them!) and the ridiculously long 1958 Lincoln Continental. It seems an immensly practical feature to me. You get a longer boot lid and there’s no need for a rear wiper. It also saves the rear seat passengers getting sunburnt on the rare occasions the sun comes out in England. I recently spoke to the man responsible for the Classic styling (and for the Mk2 Consul, opposite). Mr Colin Neale was head of Ford styling at the time and said that the reverse window was almost forced on him by Sir Patrick Hennesey, Ford UK boss, as it meant they could use flat glass for the rear window and save a fortune! On the left side of the road,: early Ford Consul Mk2, Vauxhall Victor FA estate, Bedford CA, Standard Atlas? ?, Hillman Minx? ?